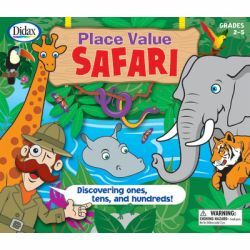 Players must fill their safari boards with base ten units and rods to escape the hungry tiger! Students will learn about adding and subtracting in tens, the language of exchange, and grouping in tens. Includes playing boards, counters, dice, and base ten units. 2-4 players.